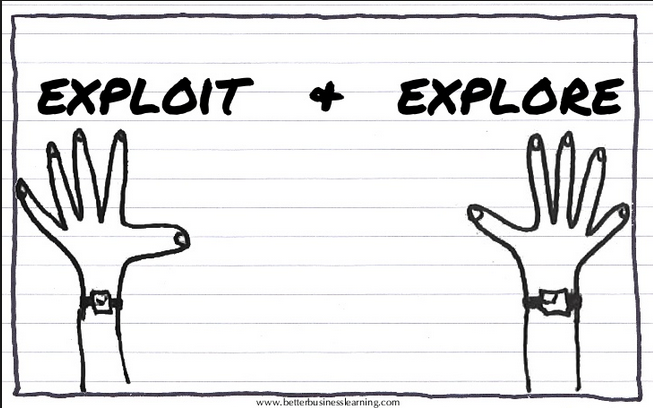 So how do you manage exploiting and exploring for Innovation? So how do businesses organise their structures to be able to simultaneously manage the needs to exploit and explore innovation? In this post I wanted to explain my thinking through on this ability to be ‘ambidextrous’, knowing the difference of when to exploit and when to explore as essential to leveraging innovation, in all its forms and watching out for some of the traps in not managing this well. Managing this, in all honesty, though, is hard to get the balance right but highly valuable if you do achieve it, it can transform the business. Many of our organisations struggle to manage both successfully as they tend to focus more on separation mostly in organisational structures alone as their attempt to become ambidextrous. It is far more than ‘just’ this. Get the balance right across the organisation’s design and in its leadership management, it becomes a very powerful mechanism for accelerating performances by delivering significantly new innovation and equally sustaining and leveraging the core business you have today. Recently I contributed a blog post over on the Hype Innovation Blog ” Balancing Exploitation & Exploration for Changing Performance” that opens up the subject but then extensively dives into three examples of Apple, GE and Google that are working in highly ambidextrous ways, pursuing exploiting and exploring in their own unique ways. We never seem capable of adapting as well as we should do. Adapting always seems a work-in-progress, or it is often something where we are simply making little or no progress! We often stay ‘stuck’ in the way we do ‘things’ around here, never seemingly able to break out into something new or different. To adapt we need to open ourselves up to learning and adjusting our organizational ‘form’ in new ways. In business there should be a constant battle to reconfigure the assets and extend the existing capabilities. Yet often these stay ‘static’ not learning or improving. In our innovation activities there is an even greater pressing need to build into our thinking the ability to find more dynamic capabilities. It is a constant innovator’s dilemma to think through and get right. Do we know what are the dependencies and requirements for building and sustaining your organizations innovation success? How do you sustain innovation, is it more through the structuring of everyday work, by creating a particular set of social rules and resources that foster specific routines? Or something different? We work really hard at maintaining these re-occurring processes, never willing to extend and push them in different and new ways. We have actually become very static in our approaches and learning, we are not learning anew. We often simply end up with incremental innovation that might just ‘nudge’ the growth needle but does little more than sustain us in the present and can be ‘contained’ in a tidy process that makes many, including the ‘bean counters,’ very happy until someone changes the game. Then we need to think differently but this is usually far too late.. As demand is more volatile today we need to experiment, explore, learn and adjust. What becomes more important is the ‘work to be done’, and how we go about tackling this and not the ‘work done’ where we often simply ‘default too. Surprisingly Adam Smith identified this important difference in work way back in 1776. Anyone who has felt the ‘full force of the wind’ will know the feeling of how hard it is to keep on your feet, to stay determined to stay upright and true, to hold the course, whatever happens. When you feel the force of change running through the organization, you tend to have that same sensation, to resist the force with all your energy. It is often really hard to let go, the environment was something you had become used to, you accepted and become resigned to its weaknesses and constantly exploited its possibilities or even possibly the other way round. 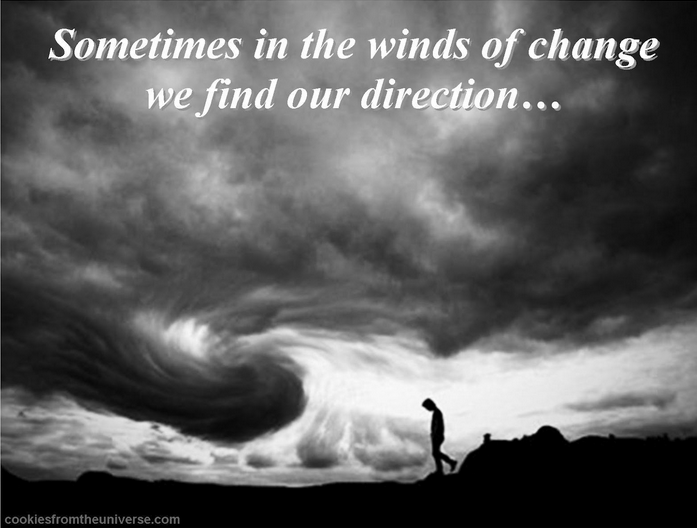 Change is all around us, it is accelerating not abating. Do you feel you are trapped, encircled and just a little concerned. You often hear of volatile trading conditions, a more complex market and situations changing constantly and moving faster than ever. ‘Much’ seems to be closing in on us. We do know we need to re-equip ourselves for constant disruption; we are really beginning to see a shift from the classic bell curve into more of a shark fin for adopting change. One that is characterized by sudden, even violent success or an event, some moments of brilliant dominance, followed by a dramatic change in conditions as others have spotted the same opportunity and you hit a rapid decline, the race to the bottom of competition constantly negating one another. Market are segmenting, the life cycle is shortening or having an even longer tail of dealing with slow decline and constant erosion of any competitive position. 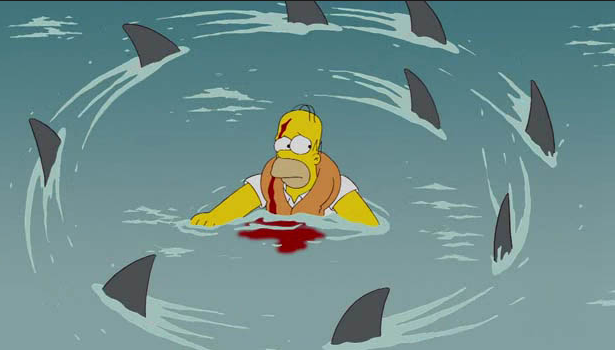 The sharks are arriving even earlier and in a greater need to show their dominance. It does seem “creative destruction” is a central force in many of our activities. Activities where innovation is continually replacing not just in products and new services but in designing radically different business models, searching to replace less adaptive competitors in the marketplace at faster rates. Adoption is far earlier, the pace of change is quickening and from this the competition is responding in new ways, often surrounding the new innovation with their version, built on often a really ‘fast follower’ principle to keep in step, and throttle off any different adoption, knowing what it costs to have to win this back over time, if it can at all when it switches. The life cycle is becoming even more important to manage in all of its stages, as its traditional shape I feel, is radically altering. It is coming faster and fading away quicker unless you manage its parts very specifically. 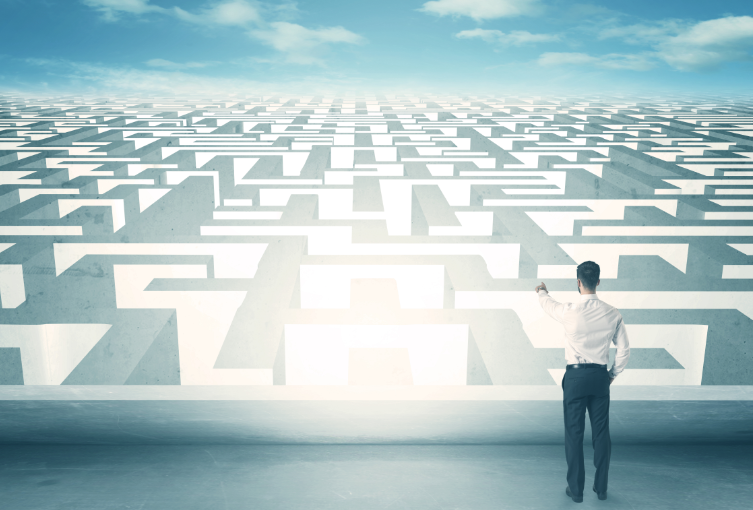 Option pathways are those viable alternatives available when you are suddenly confronted with the need to change. By being proactive, anticipating and structuring the options ahead you can be more prepared for disruption, you can respond with more thoughtful reactions. Have you ever considered option pathways? Having available options so you can react to sudden changes, as more sketched out scenario’s that are representing possible variables, the better prepared you might be to respond thoughtfully. Preparation for blunting or neutralizing possible attacks, vulnerabilities and changing business conditions is more than helpful, because you have made some investments in different possible options and far more ready to respond in thoughtful ways and not simply in those knee-jerk reactions, simply needing to respond. Considered response, with significant parts already thought through can safe significantly on ill-considered ones.